Evening folks…a number of people have been asking if colored objects seen in my Milk Way photos are real objects. Well, they are indeed for real…. The other night after returning from a great show in Portland I pointed my telescope to the Lagoon and Trifid Nebula also known as M8 and M20. These are two of the most colorful objects you can see in my Milky Way shots. This photo represents about 4 hours of light collection. The Trifid Nebula M20, on the top, is a combination of an emission and reflection nebula. Hot young stars in the southern part of the Trifid have excited the hydrogen atoms in the surrounding gas, causing them to emit red light. In the northern part of the Trifid, in contrast, the stars are not hot enough to excite the gas; the blue glow is the result of starlight being reflected by a myriad of dust particles. 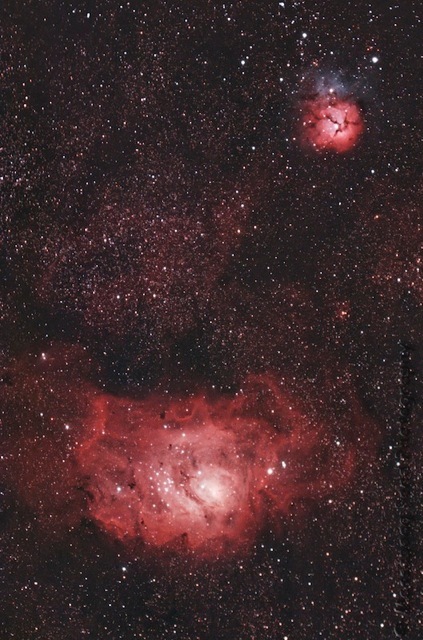 Some dust lanes which are not illuminated by starlight run in front of the red parts, forming the famous Trifid lines. The Lagoon Nebula M8 is an emission nebula. It got its name from the shape of the dark lane crossing through the its center. In M8 a lot of small dark globules, the so-called "Bok globules", which may eventually condense into stars, can be found sprinkled throughout the nebula on photographs. A cluster of young stars which is superimposed on M8 originates from the nebula. The brightest part of M8 is named the hourglass region. So there is todays science lesson….